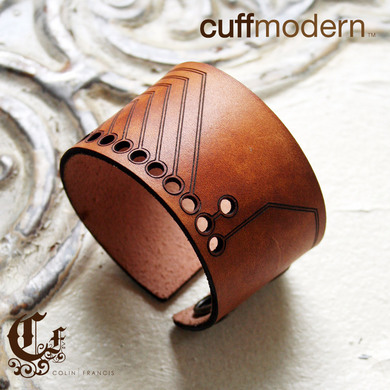 Laser Cut Leather Cuff Bracelet #WearableWednesday « Adafruit Industries – Makers, hackers, artists, designers and engineers! ‘substrate’ cuff bracelet is laser cut veg-tanned leather, 8oz. thickness, dyed, and finished to perfection. approximately 2 inches in width and 8 ½ inches in length. securely fastens closed with 2 heavy-duty snaps. this particular cuff bracelet will be sized to fit – within a range of a 5.5 inch circumference wrist to a 7 inch circumference wrist. this particular cuff bracelet is finished in english tan.